“We started a wrestling match. We had to wrestle with them. And kick and scratch and fight,” says Dr. David Morwood, one of the tenants, and now one of the owner-occupants of 665 Munras Ave., about the epic battle with a Florida-based equity fund that owned the building. The story goes back at least a decade, maybe more. The property, owned by Paul Verga at the time, had been a car dealership, bank and, currently, a suite of medical offices, including Morwood’s, a plastic surgeon. Morwood, in fact, at 13 years, was the longest-running tenant in the building, which houses medical offices, including a surgery center, allergist, radiology suites, hearing aid center, among others. But since Verga’s death in 2002 and the 2008 real estate crash, when the building went into foreclosure and eventually ended up in the hands of the Florida equity fund, the building had fallen into serious disrepair. Morwood’s office experienced leaks and a partially collapsed ceiling. His entreaties to the absentee landlords went unheeded. Unfortunately, the building wasn’t on the market and the owners didn’t want to sell. So Morwood had to come up with a strategy to gain ownership. And since he wasn’t an expert in real estate, he consulted several friends and acquaintances who were. Folks like former City Councilman and developer Carl Outzen, renowned property owner Mike Marotta, commercial real estate professionals John Mahoney and Patrick Stafford, attorneys Andy Swartz and Mark Myers, bankers Clay Larson and Steve Keller. Morwood recalled it takes a team to win the Super Bowl. With this Dream Team of experts and community leaders, Morwood set out to form a coalition of other tenants, business leaders, bankers and local businesses in the neighborhood to join in the effort. He called his long-term associate Dr. David Awerbuck, ENT surgeon, to add some “heavyweight expertise” and experience to the group. Not only is Dr. Awerbuck an expert ENT surgeon, he has an MBA from the University of Southern California. So this coalition made an unsolicited offer to the equity fund, which is when all the “kicking, scratching, maneuvering, negotiating” and yes, wrestling, began. It was a long, arduous process, but the equity fund relented and agreed to sell the building to the coalition. “I think they started to feel the pressure,” he says. The deal closed in July, with most of the tenants on board as owner-operators and the whole effort was named 665 LLC, although Morwood said it would be renamed something along the lines of the Munras Medical Complex. The building only has one space open now, the allergist has expanded operations and the Revitalessence Medical Spa & Laser Center has opened a branch. The Monterey Chamber of Commerce will hold a ribbon-cutting ceremony and reception to celebrate local ownership of the 665 Munras building on Thursday, 17 Jan. 17, 2019, at 5:30 p.m. The public is invited to attend. Daryl Guberman & Guberman-PMC have been the leading force in trying to expose the anti-American ties of some of the leading organizations of Quality Registrars. 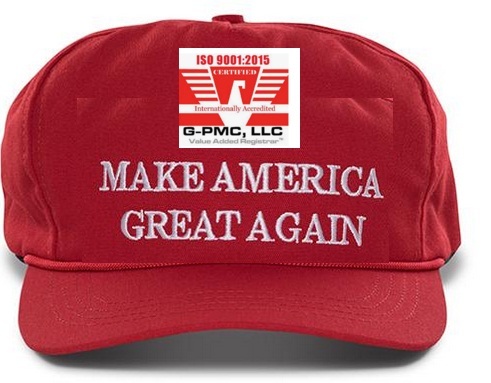 To celebrate these efforts Guberman is offering a “Make American Great Again” hat to supporters of his YouTube channel and work. New York, NY, USA, December 24, 2018 — The idea that quality in American industries should be looked over by American companies and not ones with direct ties to America’s outspoken enemies shouldn’t be hard to understand. Despite this, the passionate pro-American Daryl Guberman> founder and CEO of Guberman-PMC have had to make it his personal mission to shed light in this area both offline and through using YouTube as a medium to help educate the industry. In a recent YouTube video driving home this pro-American message, Guberman has even offered a free #MAGA, while supplies last, to whoever calls in at 203-556-1493 or sends an email to ceo@dguberman.com to express support. Some highlights of spaces Guberman-PMC Registrars can cover include ISO 9001 – Quality Management Systems, IATF 16949 – Automobile Related Products, ISO 14001 – Environmental Management System, ISO 13485 – Medical Devices, AS 9100 Rev D – Aerospace Industry, GMP 2015 – Good Manufacturing Practices, VOB 9009 – Veteran-Owned Business, and CWOB 9009 – Woman-Owned Business to name just some of the list. 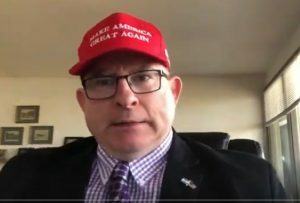 Daryl Guberman and Guberman-PMC have made it clear recently that not only are they both pro-America and pro-Israel, which has always been upfront, but that they also completely endorse and support the #MAGA movement. Guberman turned to YouTube to answer those who have asked why. In the video, Guberman goes into great detail about the questionable foreign ties of the IAF and ANAB, showing photos and other evidence that this is not something being imagined, but real. And definitely opposed to the idea of “Making American Great Again”, it is fact the polar opposite. The hope in spreading this information far and wide is that the many business owners who don’t realize who they are supporting choose to instead work with the America-based Guberman-PMC or even the ones that did know, come to their senses, and cut these ties before any potential harm is done to their business, the quality of the work they put our, whatever may be, and certainly their reputation. 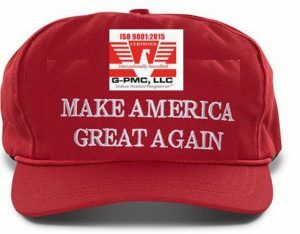 As long as supplies last Daryl Guberman is offering a free MAGA baseball cap to anyone who writes him an email or gives a call requesting one, so they too can show open support for the winning idea to “Make America Great Again”. Not only is the hat free, but the generous Guberman is even paying for the postage. A free phone consultation is also available for any businesses wanting to bring on the American owned and operated company to satisfy their quality needs in an ethical way. To learn more about Guberman-PMC and what they have to offer be sure to check out http://dguberman.com. Del Rey Oaks, CA, December 23, 2018 — To Heather, her dog Trigger is more than a companion, he’s her “gift from God” and a certified Emotional Support Animal (E.S.A). But even more than that, he’s a member of her family along with her husband and three kids. Heather is a U.S. Navy veteran, a former mineman used to dealing with high explosives, and suffers from PTSD. Trigger helps her deal with everyday life as a PTSD sufferer. So when Trigger fell ill, with blood and vomiting, he was diagnosed with a multitude of conditions that needed to be addressed right away, Heather’s heart sank. Heather and her family were faced with a very difficult decision. The family was not able to afford the necessary medical treatment for Trigger. Without treatment and surgery, he would surely die. Luckily, Pet Specialists of Monterey, one of 20 partners, graciously arranged to have Trigger receive assistance from Max’s Helping Paws Foundation (MHPF). Max’s Helping Paws Foundation is a Monterey County-based animal welfare organization that has actively given back to the community by helping more than 100 senior, low-income, veteran, disabled, disadvantaged and in-need responsible pet owners in the past 18 months. Since its inception in mid-2017 it has awarded $75,000 in financial assistance to those needing it. Max’s Helping Paws is a financial lifeline for those desperate to save their dogs and cats from unexpected circumstance. But other dogs and cats may not be so lucky, their owners are constantly faced with decisions that no pet owner wants to face. “These are my babies, I don’t have kids. I think about their own happiness before my own. I’d go homeless before I’d get rid of her,” said one, Sarah. “We wouldn’t amputate his arm — he’s so young. I considered putting him up for adoption,” said another. This year, Max’s is also part of Monterey County Gives fundraising campaign. >$100 can provide medications for a pet in need. >$300 can pay for critical blood/lab work. >$500 can pay for biopsies and diagnostics to determine if a pet has a chance. >$1,000 can provide initial treatment of chronic illnesses, including diabetes, Cushing’s, Addison’s, asthma and some cancers. >$2,000 can provide a life-saving amputation or surgery. A generous donation to Max’s through MC Gives! allows Max’s to continue to help families from having to make difficult decisions and save their pets from an awful fate. To donate, go to the MC Gives! website at www.montereycountygives.com/PAWS. To be accepted as part of Monterey County Gives!, all checks from donors must be made payable to CFMC/MCGives!, and include instructions that it is a donation for Max’s Helping Paws Foundation, either in the memo line or on a separate piece of paper. Carmel, CA, December 21, 2018 – Savor appetizers from local chefs including La Balena/Il Grillo, Chef Annie Hobbs from A Taste of Elegance, Chef Soerke Peters from Etats-Unis, and Terry Teplitzky from Michael’s Catering/Wild Thyme Deli & Cafe! Enjoy a sweet treat from Lula’s Chocolates and Sweet Elena’s. Sip a glass of award winning wine from Scheid Vineyards, or some of Carmel Craft Brewing Company’s signature beer. Listen to the sounds of stringed instruments of Terrence Farrell. 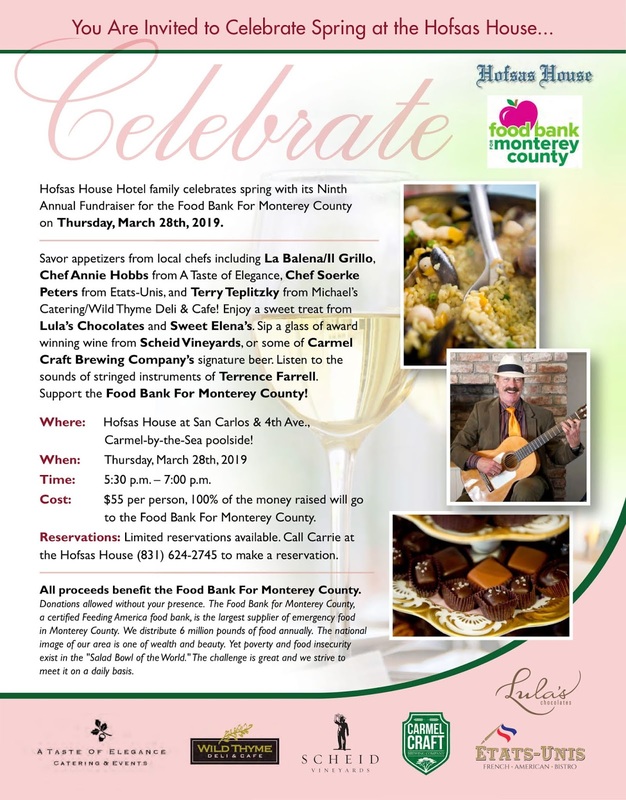 Support the Food Bank For Monterey County! Where: Hofsas House at San Carlos & 4th Ave.,Carmel-by-the-Sea poolside! 100% of the money raised will go to the Food Bank For Monterey County. Reservations: Limited reservations available. Call Carrie at the Hofsas House (831) 624-2745 to make a reservation. All proceeds benefit the Food Bank For Monterey County. Donations allowed without your presence. The Food Bank for Monterey County, a certified Feeding America food bank, is the largest supplier of emergency food in Monterey County. We distribute 6 million pounds of food annually. The national image of our area is one of wealth and beauty. Yet poverty and food insecurity exist in the “Salad Bowl of the World.” The challenge is great and we strive to meet it on a daily basis. Monterey, CA, December 20, 2018 — The biggest and best Super Bowl party will take place Sunday, Feb. 3, 2019, at Knuckles Sports Bar at the Hyatt Regency Monterey Hotel & Spa. Voted the number-one sports bar on the Monterey Peninsula for 15 years in a row, Knuckles goes all-out for the biggest game of the year, in addition to its own 24 flat-screen TVs and two giant 8-foot TV screens, the adjacent viewing room, known as “The Vault,” will be opened up for even more fans, who will enjoy the game on two large-screen televisions and theater-style seating. Knuckles Executive Chef Dan Elinan will create a variety of team-themed food and beverage specials throughout game day. Knuckles’ regular menu and its wide array of craft beers and cocktails will also be available all day. Not only that, there will be a charity raffle for The Food Bank of Monterey County with some great prizes, including gift certificates to Haute Enchilada, Portobello’s Salinas, Tarpy’s Roadhouse, vodka-themed gift baskets, one-night stays at the Hyatt, dinner for two at TusCA, team jerseys, and much more. Raffle tickets are two for $5 and five for $10, and if you bring a non-perishable food item, that will score you one raffle ticket per item. Power Talk AM 1460 and FM 101.1 will be broadcasting live from Knuckles! Knuckles Sports Bar will open at 11:30 a.m., while The Vault opens its doors at 2 p.m. Advance reservations for seats in The Vault will be accepted for groups of eight or more. Reservations are limited and must be made through a Hyatt Food & Beverage Manager for parties of 8 people or more by calling (831) 657-4730. All large parties must be there in person to be seated and there will be a 15-minute grace period for arrival, after which the table will be given to another party. Reservations will not be taken for Knuckles, which is first-come, first-served. Kickoff is slated for 3:30 p.m., however, pre-game coverage will start earlier in the day. So if you want to make this Super Bowl game a fun and memorable one, Knuckles Sports Bar has to be your first choice. 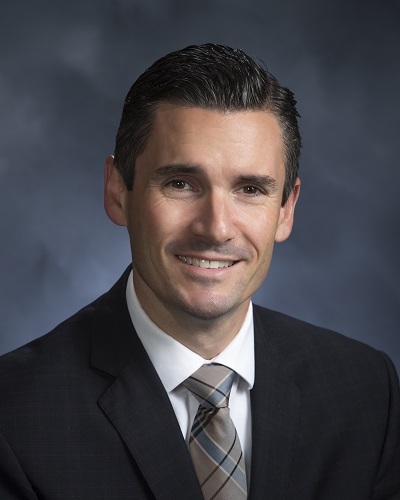 Monterey, CA, December 19, 2018 — The Hyatt Regency Monterey Hotel & Spa has announced the hiring of Kevin D. Ellis as its new General Manager. Ellis joined the Hyatt Monterey team as Director of Operations in July 2015, then promoted to Hotel Manager in November 2017, before being named General Manager. Ellis has had a long tenure with Hyatt Hotels, spanning over 18 years and eight different Hyatt properties across the United States and Canada. Nestled on 22 acres of soaring Monterey Pines, the Hyatt Regency Monterey Hotel & Spa on Del Monte Golf Course is a destination resort providing the discerning traveler the quintessential Monterey experience. Its location offers guests close proximity to downtown Monterey and Monterey Airport and easy access to some of the Peninsula’s most well known attractions. With its warm, contemporary ambiance, elegant furnishings and convenient amenities, the hotel offers both leisure and business travelers a Northern California respite of unmatched serenity and comfort. Features include 550 guestrooms including 32 suites, and the President’s House, TusCA Restaurant, Knuckles Sports Bar, Fireplace Lounge, a 2,000 square foot fitness facility, tennis courts, pools and whirlpools. The hotel is located at 1 Old Golf Course Road in Monterey, California. For information call (831) 372-1234 or visit http://www.hyattregencymonterey.com/. Explore the Towns of Marina, Salinas and Seaside, California Outdoor Adventure, Foodie Finds and Undiscovered Gems Await! Outdoor adventures. Diverse dining. Rich cultural history. Monterey County is home to all of these unforgettable experiences — and you can discover these in the towns of Marina, Salinas and Seaside along California’s Central Coast. Monterey, CA, December 19, 2018 – Outdoor adventures. Diverse dining. Rich cultural history. Monterey County is home to all of these unforgettable experiences — and you can discover these in the towns of Marina, Salinas and Seaside along California’s Central Coast. Though these three towns occasionally stand in the shadow of their more popular neighbors like Carmel, Monterey and Big Sur, they’re still can’t-miss hubs for outdoor enthusiasts, foodies and history buffs alike. Explore these undiscovered gems for a unique experience you’ll remember for years to come. grown cuisine at 201 Main in Oldtown Salinas. With an extensive wine list and an eclectic menu of fresh food, 201 Main has something for everyone. Monterey County, CA, December 18, 2018 – The Monterey County Convention & Visitors Bureau (MCCVB) has joined two initiatives that will further its goal of ensuring Monterey County is one of the world’s leading sustainable destinations by both setting ambitious goals and measuring long term impacts. The first is with Positive Impact, a global not for profit which exists to provide education and collaboration opportunities to create a sustainable event industry – and a vision to address the role of plastics in this industry. MCCVB is the exclusive destination partner for Positive Impact on this project which has already included collaboration with a number of United Nations bodies and in Spring 2019 will see the launch of materials to help the global industry measure and understand the role of plastics. GDS-Index recently released its yearly survey of global destinations at the International Congress & Convention Association (ICCA) annual meeting in Dubai in November. Monterey County scored 52% on the sustainability index just behind Geneva and ahead of U.S. cities like Washington, D.C. and Houston. The scoring allows MCCVB to set a benchmark and improve in the coming years.